While I didn’t get my picture of the full moon rising behind the center of the Skyway Bridge, I did get this. 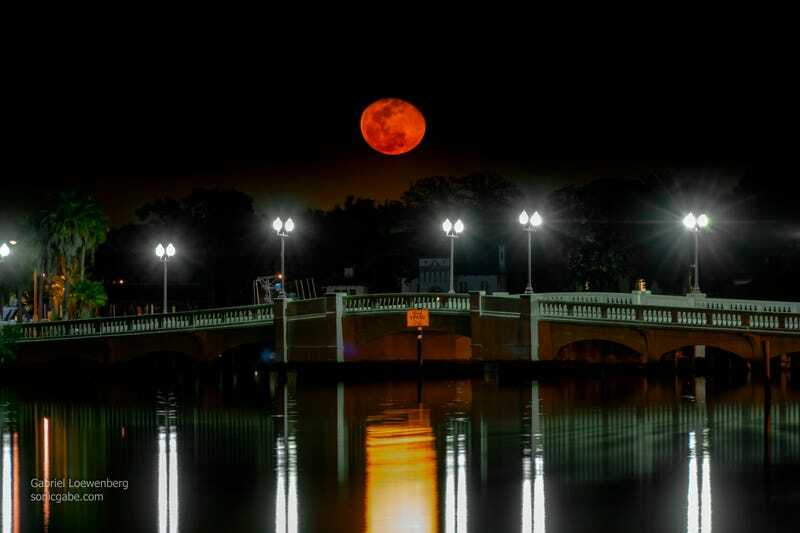 The almost full moon rising above the Snell Isle Bridge. Just a quick walk down the street and boom! Not as spectacular as the Skyway, but it’s different and special in it’s own way. Fun fact, this is actually two pictures. I took one to get the proper exposure on the moon and a second to get the water and bridge. The bridge/water shot was taken just a second after the moon pic. I edited out the overexposed moon from the second pic and blended the two whole pictures together rather than just pasting in the moon. It looks much better than way. Rather than going for a super vibrant hyper-realistic edit, I went with the natural look. This is about as perfect a representation of what it looked like to the naked eye as you could get. In April, there are three days to get the full/almost full moon rising in the middle of the Skyway. Hopefully one of those nights will be clear and I can get the shot i’ve Been chasing for a while.